INVALUABLE ROGUE FINANCIAL WISDOM SNIPPETS If you’re looking to acquire deep financial savvy and have fun in the process, then this book is for you. 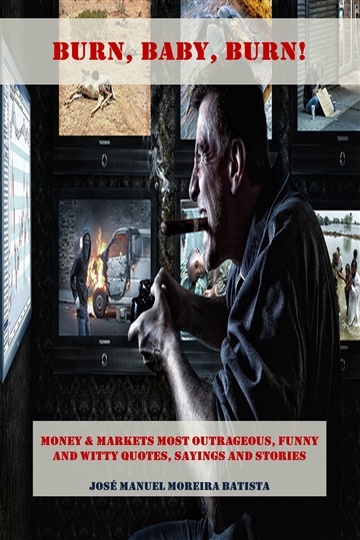 It contains a collection of the most notorious, infamous, jocose and valuable insights about money, investing and trading that you can find. Learn and laugh with the likes of Jesse Livermore, George Soros, Warren Buffett, Kyle Bass, @GSElevator, Jim Cramer and Jim Rogers. Quotes and sayings encapsulate the wisdom both of the crowd and of the smartest people ever. Plus, they often provide specific and practical advice in a memorable and thoroughly enjoyable way. THIS IS A BOOK YOU WILL ENJOY READING AND RE-READING. GET IN NOW! José Manuel Moreira Batista is a private trader and investor and manages private concerns. After graduating in Business Administration in 1982 he did a stint in the Air Force and then went on to hold executive positions in several multinational corporations until 1999. That year he left the corporate world and started the management consulting and training company that he still owns today. He also taught university courses in Corporate Finance, Financial Accounting, Cost Accounting and Real Estate. His results-oriented books and courses blend experience with a sound theoretical foundation to deliver practical, easy-to-follow knowledge that brings immediate benefits to readers and students. He lives in Cascais, Portugal.